As soon as a run is started, it will show up on the results list with a status of STARTED. The current run is usually showed on top of the list, followed by the most recently finished runs. The runs are ordered by run id and/or run date, in descending order by default. This means the most recent run is shown first and the oldest run is shown last. All the columns are sortable. You can choose to sort based on your need. 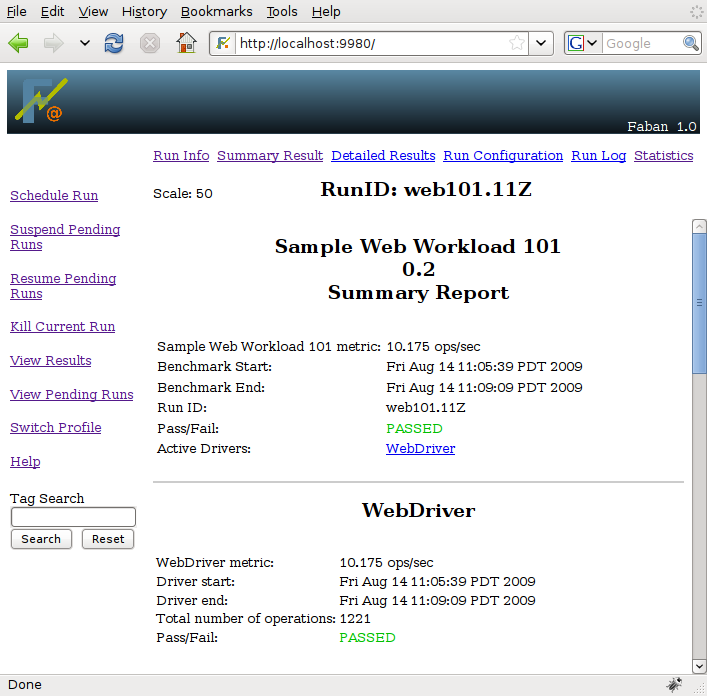 The columns shown in the result list are the description, whether the run passed all criteria or not, the scale of the run (the user setting of the load) and the metric (final run result), the run status, and the date and time the run was last updated. 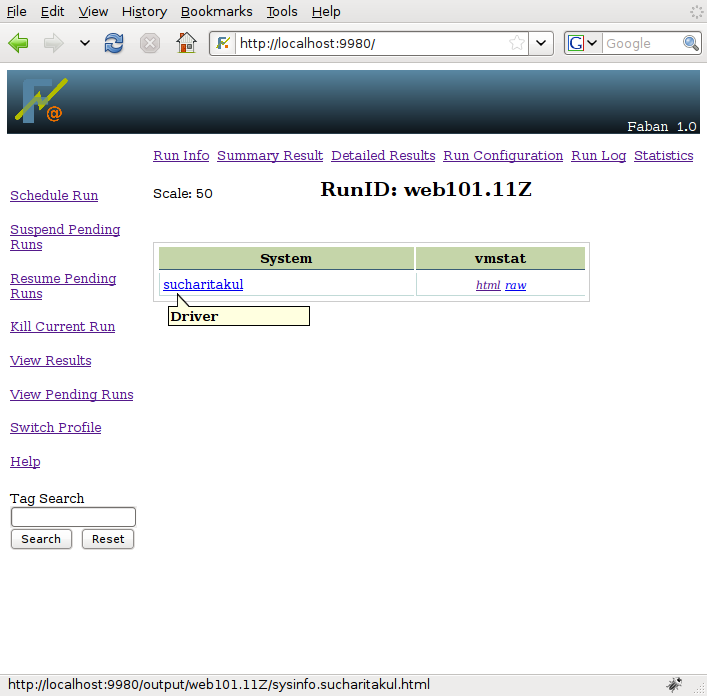 It may also show the user who submitted the run, if security of the Faban harness is enabled. Please see the Faban Harness Administrator's Guide for information on Faban harness security. The last update time means the start time for a current run and the end time for a run that has already finished. 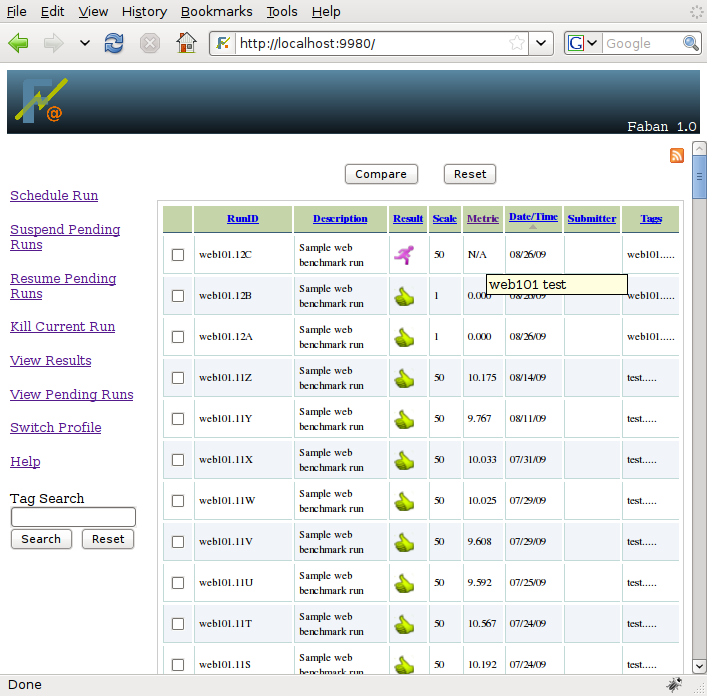 Clicking on icons in the Result field takes you to the summary report or run logs based on the status of the run. 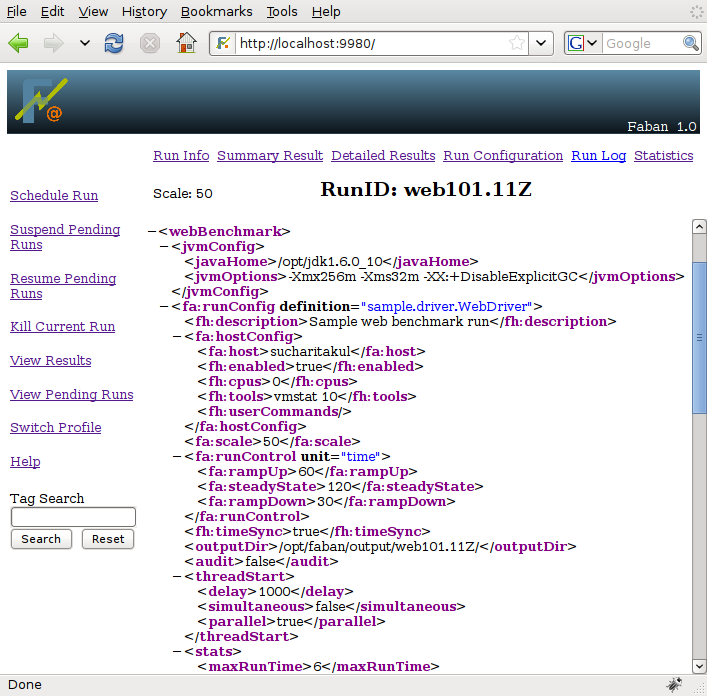 The Tags field displays the tags associated with this run. The set of tags may be too long for the table display, in which case the complete list will be shown on mouseover. Upon selecting a run result by clicking on the icon, the result navigator menu will show up to allow you to drill in to the run results. In addition, if you click on the feed icon on the right top corner, it will take you to the feed page where you can subscribe to the feeds by hitting on the "Subscribe Now" button. As you select a run to view it's results or logs by either clicking the icons in the Result field, the result navigator menu will show up on top of individual run results. The result navigator menu allows you to drill into the details of each run. The summary report and detail report are not available for runs in progress. The corresponding links are disabled. But the run configuration, the logs, and some statistics will always be available almost immediately after the run starts. The RunInfo page lists the details for each run. Description and Tags field on this page may be editable if you have the right permission. Clicking on the text will open an editable field. Just modify the text and hit "Save" button. Or if you decide not to modify, then just hit "Cancel" button. The summary report shows the final results of a run. It will clearly report the obtained metrics and a lot of the run statistics. If there are failures, the summary report also identifies the failures that have happened. The standard Faban summary report shows you the operation counts, sucesses, failures, mixes, response time, and cycle time statistics. It may also show benchmark-specific custom metrics if exposed by the benchmark developer. The detail report shows some detail statistics that cannot be represented by simple aggregated numbers as shown in the summary report. 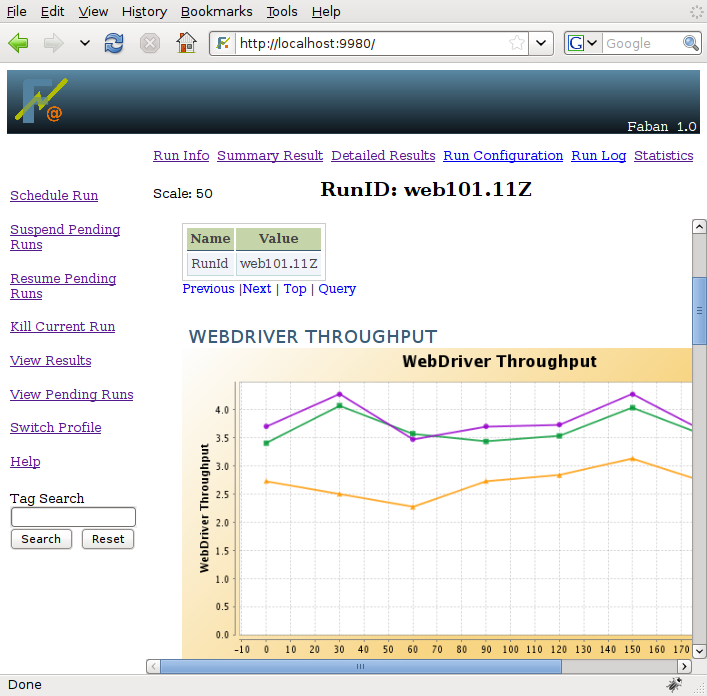 The standard detailed statistics page shows graphs of throughput and response times over time. It also shows distribution histograms of cycle times and response times which allows you to understand the characteristics much better than reading single number results in the summary report. 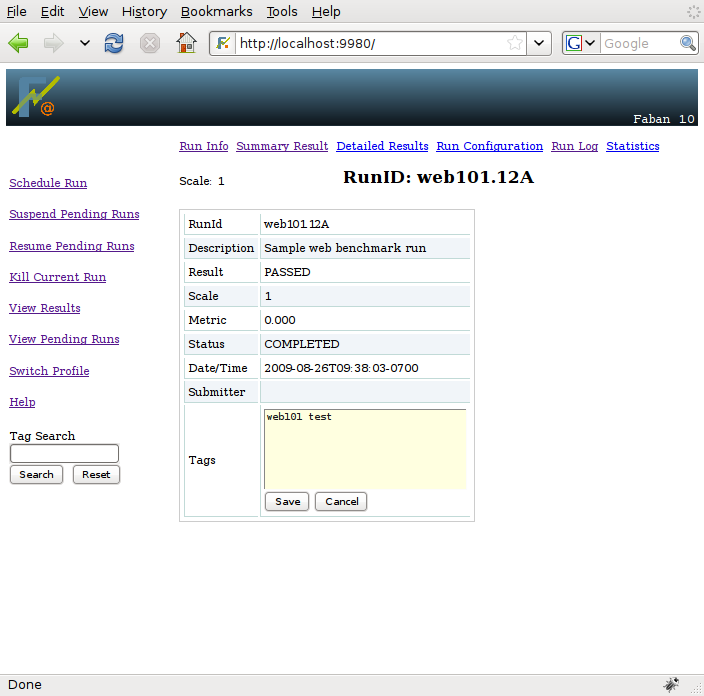 The run configuration shows the configuration files as it was submitted. While the submission is done using an easy-to-use form, the configuration file is shown as non-formatted XML allowing you to investigate the detail of the submission with ease. The run logs show you what has happened or is happening in the run. 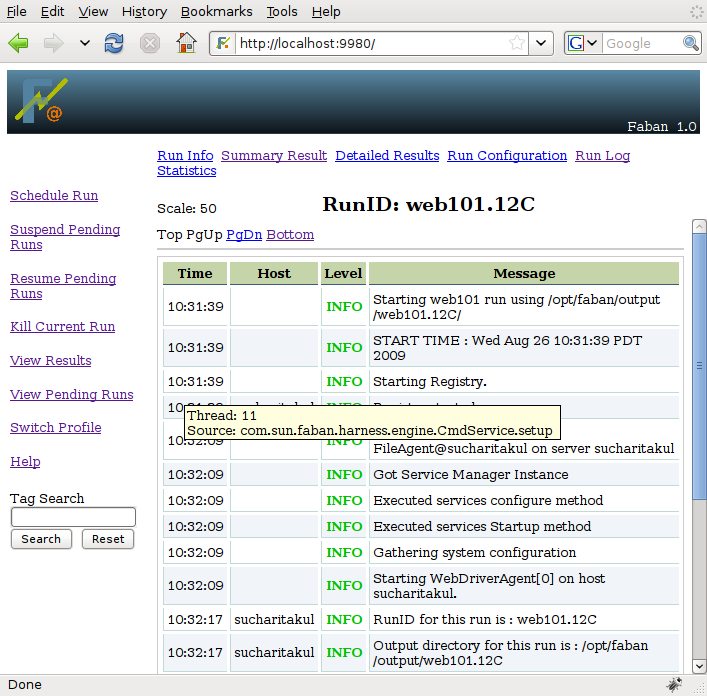 The log server accumulates the logs from all the systems partaking in the run and presents a unified view of the logs. Such a unified view of the logs is also extremely interesting as it interposes the events that happen on each system allowing easier pinpointing of problems as they occur. Mouseover of the message field shows you the the thread id and the source of this message. The statistics screen shows both system configuration information and statistics as soon as they occur. The Faban harness tools subsystem collects statistics on all the systems partaking in the run as specified in the run configuration and transfers them to the master shown through the statistics screen. The system configuration information and the statistics are shown in a system-dependent manner. If any of the statistics can be postprocessed into a graphical form, Faban will call the post-processor on such data directly. The first link shown for all systems is the system name, which links to its information and configuration, followed by the statistics produced by tools, ordered aphabetically by tool name. Each system is represented on each row and the systems are ordered by their role in the benchmark, according to the order of the roles in the benchmark configuration file. The driver systems are always listed last. This allows two rigs with different system names to have the same ordering.Holding the mouse over the system name also shows a tool-tip explaining the roles of that system and the network interfaces or alias names used for those roles. All statistics provide text results, some results compatible with the postprocessor are also shown in html. The Faban harness calls FenXi, our postprocessing tool, to do such postprocessing and graphing. 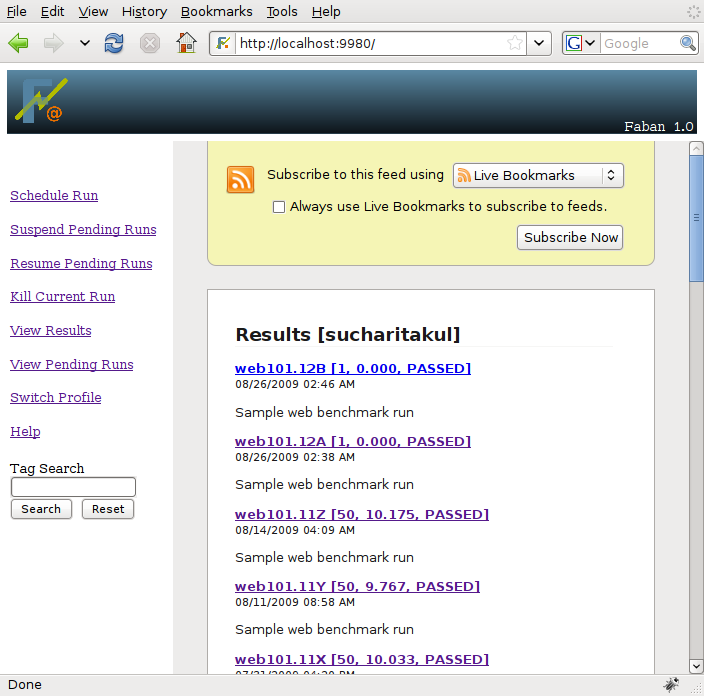 For such statistics, both text and html results will be available. In certain cases, you'll want to clear up run results that are no longer needed. Not only do these results clutter up your result list. In some cases they also use up a lot of storage space. Removing run results is one of the few functions that are not provided through a GUI.